Alone in Berlin by Hans Fallada was a completely random choice by me at the library. The book was first published in 1947 and although it’s a Penguin Modern Classic, I had never heard of it. What a read it is! Given the subject matter it is obviously not a comfy read in fact it’s really quite horrific in parts, especially when you realise that a lot of it was based on actual happenings. The setting is Berlin in 1940. It’s a city full of fear, run by thugs and gangsters in various uniforms, with spies everywhere. Many of the people are Nazi Party members, often just so they can get a decent job, but then they are expected to contribute so much money to various Nazi funds. It’s quite similar to the austerity that the British government likes to control those of us in the UK with – only worse. But some of the people are tired of living in fear and when Otto Quangel’s soldier son is killed it’s the last straw for him. He has to do something to fight against the Nazis and decides that the best thing he can do is write postcards criticising the Nazis and the war and leaving them around Berlin, thinking that they will be passed around by whoever finds them. His wife Anna thinks that they should be doing more than that but as he would be executed if he was caught she agrees that it is enough and ends up helping him. Sadly almost all of the postcards are handed in to the Gestapo as soon as they are found. Everyone is too terrified to have something like that in their possession. Gestapo Inspector Escherich has the job of tracking down the perpetrator, and his superiors aren’t impressed that it is taking him so long to do it, he’s living in fear of being sent to a concentration camp if he can’t find the culprit. Meanwhile the other inhabitants in their tenement block are brought into the story. Mrs Rosenthal is an old Jewish woman, on her own now since her husband was taken away by the Gestapo. The Persickes are red hot Nazi thugs, drunken and violent and keen to get their hands on Mrs Rosenthal’s possessions. Alone in Berlin tells how the Nazis got a grip on the German people in 1933 and by the time they started taking over other countries their own people were also well under control. Of course lots of them were very enthusiastic Nazis but those who weren’t had to keep their heads down, otherwise they would lose them! It had never occurred to me before that while people in the UK were having to live with harsh rationing, a lot of Germans were enjoying the good life as so much stuff had been looted from the countries that they were over-running. 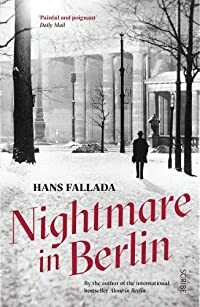 This is a great read but Hans Fallada got the idea for it from an actual couple who did exactly what Otto and Anna had done, and came to a similar end – a horrible thought. The author had quite a wild life himself, with alcoholism and drug addiction. I’ll definitely be seeking out his other books. This book is a Penguin Modern Classic so I read this one for the Classics Club.